The IScAI 2012 courses will run from May 14th to June 15th. There will be five intensive courses, to be held at the IAC headquarters in Tenerife (Canary Islands, Spain). The registration fee is 350 € per course. Limited Financial aid can be requested to the IScAI Board of Directors. Optics (20 hours): Students will learn the basic concepts of optics and imaging, and the use of optical design/analysis software tools. The course will provide an overview of common astronomical optical systems, including telescopes, cameras, and spectrographs, and their common components (mirror, lenses, etc.). It will present a basic methodology for preliminary layout and analysis of astronomical instrument systems. Last year course syllabus*. Lecturer: Stephen S. Eikenberry (University of Florida). Dates: 2012 May 14th to May 18th. Mechanics (20 hours): Students will learn the basis of mechanical design, including analysis of precision designs for opto-mechanical and robotic systems, and other related disciplines such as materials, mechanical components, cryogenic systems, vacuum technology, structures and mechanical manufacturing processes. Last year course syllabus*. Dates: 2012 May 21st to May 25th. Management (20 hours): Students will learn to describe projects in terms of work packages, to establish a schedule with milestones and deadlines, to control budget and cash flow and to discuss requirements and specifications with both the scientists and the engineers to make them understand the project. Last year course syllabus*. Dates: 2012 May 28th to June 1st. 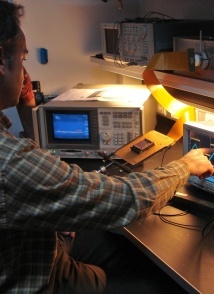 Electronics (20 hours): Students will learn the fundamental subjects of electronics needed to control an instrument for astronomy, focused mainly in the data acquisition systems (getting data with image detectors), in the control systems for mechanisms and other related tasks. A clear procedure will be shown to design, build, integrate and check an entire control system from the beginning until the end of the project. Last year course syllabus*. Dates: 2012 June 4th to June 8th. Software (20 hours): Students will be familiarised with modern tools and the latest trends in software design. The aim is to guarantee the appropriate quality in software development. Last year course syllabus*. Lecturer: Nicolás Cardiel (Universidad Complutense de Madrid). (B) carry out a conceptual design of a simple instrument proposed by the IScAI Board of Directors and the IScAI lecturers. This latter work will be remotely supervised by the IScAI lecturers. (C) perform an oral presentation on the instrument conceptual design. *NOTE: The syllabuses (2011 courses) may change slightly until March 31st.